I noticed that behind mountains are more mountains – with swamps and timeless water in between. and people too – whose names don’t matter to anyone but themselves. One of the sketches I did during my holidays in sweden. Another concept work for my worldbuilding stuff. 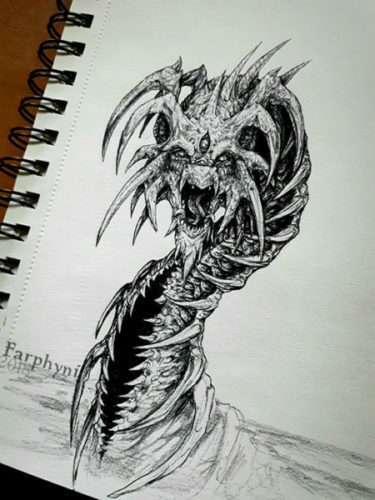 This time a sort of fusion between dragon, snake and centipede, which lives in swamps. I call them Djallthari. They belong to the fifth world. Djallthari are very rare, rarely mate and get veeery old. They are very grumpy creatures. The only living beings they respect are ducks and toads – all others are considered as food or enemy (which is basically the same for them). A Djallthar is always hungry, but doesn’t have to eat often in order to survive. Most of the time they sleep at the bottom of the swamp or scare travellers. And rumors say there are hidden pathways between all swamps of the worlds, connecting them and making it possible for the Djallthari to travel very fast and without being seen. That’s why they are seen as gatekeepers in folklore. Is that a mouth on the neck? You see it wrong! That’s actually epic. because they can constantly eat while crawling around. They eat everything – dust, plants, rocks, insects, swampwater, etc – so it’s perfect for them.